Minted from 1837 until 1891, the Seated Liberty Dime enjoyed a production span of over 50 years, longer than the production for any other dime. This coin is 90% silver with a melt value of $1.08 based off current silver price of $14.98 oz.The dime was designed to be visually similar to the other Seated Liberty coinage produced during that time frame, the Seated Liberty Quarter, Seated Liberty Half Dollar and Seated Liberty Dollar. 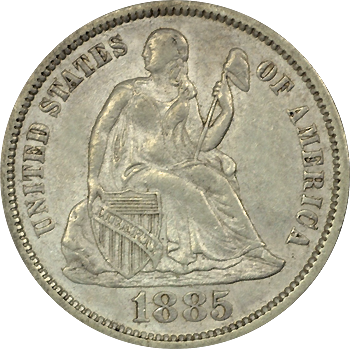 One companion coin, the Seated Liberty Twenty Cent Piece, was minted from 1875 through 1878 but was discontinued as being too similar to the quarter and was considered superfluous. Because the Coinage Act of 1837 standardized silver content values, the Seated Liberty Dime metal content consisted of 90% silver and 10% copper. While the diameter stayed the same at 17.9 millimeters, the weight of the coin changed over it’s production run. After government legislation in 1872, the 90%/10% metal content, 17.9 millimeter diameter and 2.5 gram weight became the established standard for dimes that held true until 1965. The weight variations were accounted for by design changes which included the addition of arrows in the 1873+ dimes. The Seated Liberty Dime was minted in Philadelphia, New Orleans and Carson City. Even though well over 100 million of these coins produced, common Seated Liberty Dimes in poor condition still have a value in the $25 to $50 range. There are exceptions to this scattered throughout the years and mintages. These exceptions include short runs, design changes and die flaws and may increase the value of even a poor coin dramatically. The most significant exceptions are the 187x-CC series being the most notable. 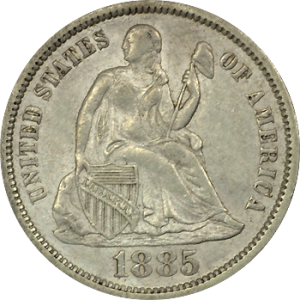 As an example, perhaps the most important of the Seated Liberty Dimes is the 1874-CC Arrow which, even in poor condition, still runs in the $10,000 range. A 1873-CC No Arrows Seated Liberty Dime appears to be a unique strike and sold recently for $1.84 million.